This post will be on cheating… the tasty kind of cheating. 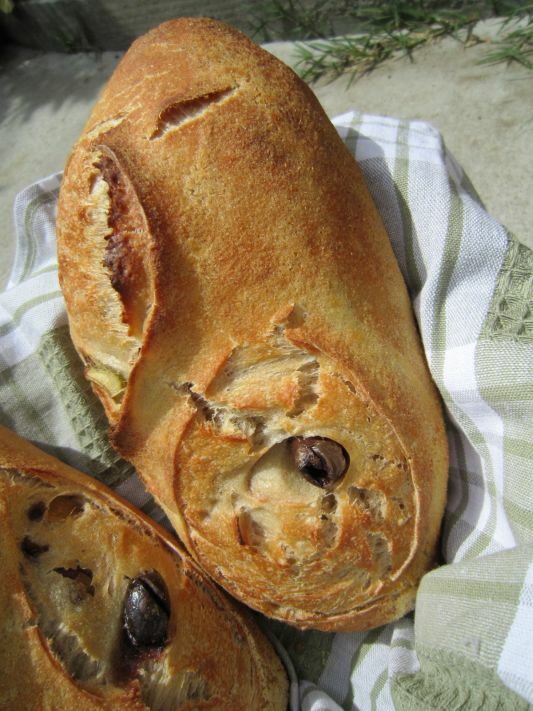 I made up some Kalamata, Artichoke Sourdough and I added something to make the bread sour… by cheating. It was certainly a fun and tasty way to bake up some loaves of bread! 12 oz -spiced Kalamata Olives/ drain the liquid and reserve both olives and liquid separately(liquid should be around 5.5 oz). 6.5 oz -Pickled/spiced Artichoke Hearts / drain the liquid and reserve both artichoke hearts and liquid separately(liquid should be around 3.5 oz – combine with the olive liquid). Combine both the artichoke and olive liquids together to obtain 9 oz /255g of liquid. 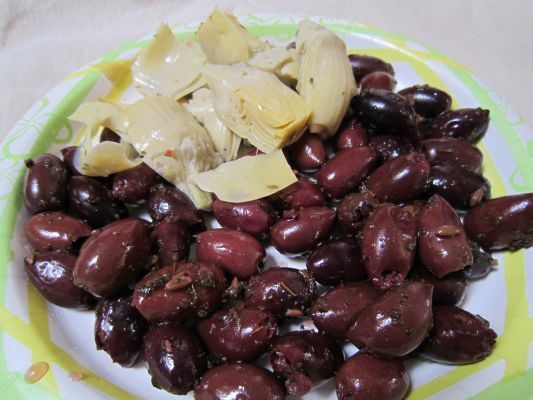 Set aside the olives and artichoke hearts to drain on a plate and then towel dry/squeeze the olive/artichoke pieces. 9 oz/ 255g of the reserved liquids from combined hearts and olive liquid which you reserved. 30 oz flour 850g- use approximately 20 oz Bread flour and 10 oz All Purpose flour combined. After autolyse, add .7 oz / 19g sea salt. Start this mixing of the dough around 3:00 pm in the afternoon. Mix together by hand or mixer all of the ingredients except the salt. After the ingredients are mixed together, cover the dough with plastic or a lid and let the dough set for 30 minutes (autolyse period). After autolyse is done, add the salt, the reserved artichoke hearts which you have chopped into smaller pieces and the olives. Hand knead gently in the bowl or mix on slow in your dough mixer until salt is well mixed in. Cover your dough so it doesn’t dry out and let it ferment for about 5 hours. During the ferment time fold the dough around 4-5 times. 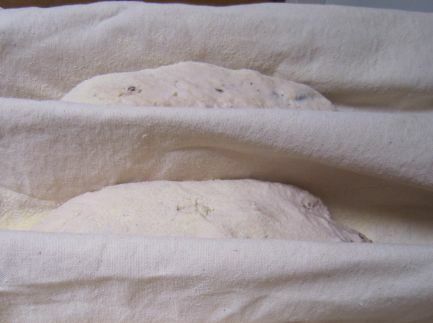 When bulk ferment is done, cover the dough well and refrigerate overnight. This will make 4 lbs 9.2 oz/2075g of dough at 65.8% hydration. Next morning take out your dough, uncover it and let it warm up at room temperature for three house, turning the dough once in a while to even the warming process. Then divide the dough into two, three or four loaves depending on what size you want. Shape your dough into the desired shape and place into well floured bannetons or couche. I use semolina flour. Remember it is better to stagger the shaping of the dough by 30 minutes for each loaf so the loaves are not all ready to go into the oven at the same time. Now allow the dough it’s final proof. This will take anywhere from one hour to three hours, depending on the activity of the dough and how warm your kitchen is. When it looks like the loaf has one hour of proofing left, turn your oven on to 450F degrees and preheat it with a baking stone inside, for one hour. 10 minutes before you will bake your first loaf, preheat a roasting pan lid in the oven. When the dough is done proofing, turn out your loaf and slash the top, then slide the dough onto a peel which has been sprinkled with semolina flour. 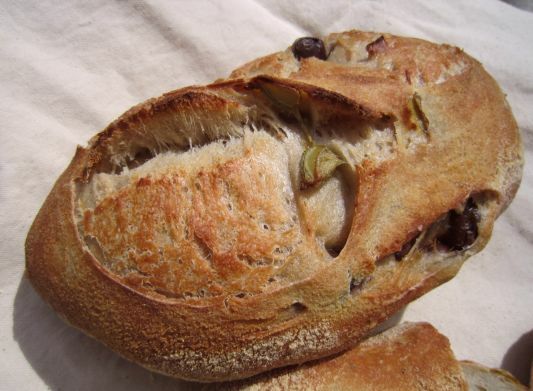 Slide the dough onto the hot stone, spray the loaf all over with water, then place the hot roasting lid over the dough. Close the oven door and bake for 20 minutes. After 20 minutes, take off the roasting lid to allow the crust to crisp up and brown. Bake for another 10 -15 minutes until the color is a nice deep color. If you notice that the loaf is browning too fast, turn the oven down to 425 degrees for the last 10 -15 minutes of the bake. Take out your beautiful loaf and cool on a cooling rack. Reheat the oven and then bake the next loaf. 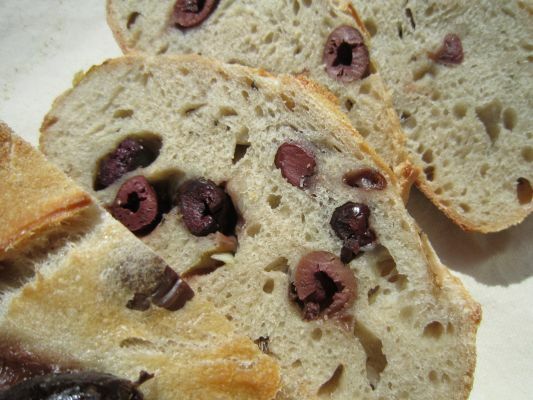 The cheating loaves have a wonderful tangy flavorful crumb with the help of the vinegar/oil/spices of the liquid added from the olives and artichokes. I had teenagers racing to the kitchen to grab up the slices as soon as I gave the go ahead. 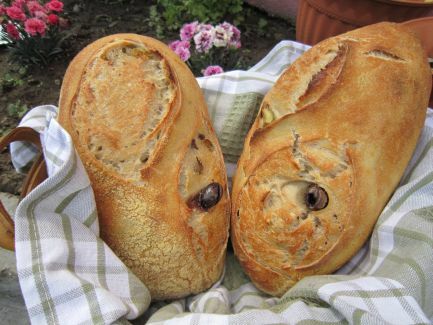 You will want to give this bread a try. Have fun baking, I do! 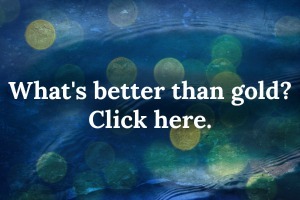 This post will be sent to Susan’s wonderful blog at Yeast Spotting. Go check it out, she always has something nice baking! 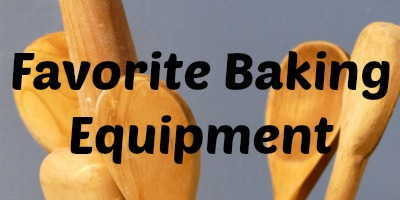 What Are You Baking This Summer? 50K Celebration Info and Memorial Weekend. 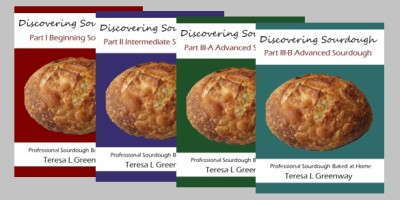 Make Your Own Sourdough Starter With Me! Live Event! 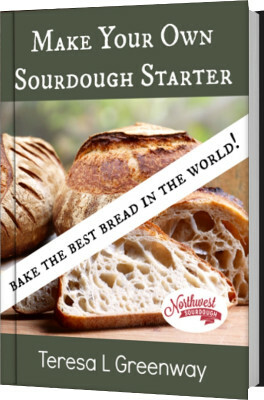 New Course Launch – San Francisco Sourdough!